Donald M. Ginsberg, a world authority on superconductivity, passed away on May 7, 2007, at his residence in Urbana, Illinois. He was awarded the 1998 American Physical Society's Oliver E. Buckley Prize (the highest award in condensed matter physics) for his work on high temperature superconductivity. Among the achievements for which he was honored, Ginsberg created what were universally acknowledged at the time to be the world's finest samples of yttrium-barium-copper-oxide, and freely shared them to the scientific community worldwide. Because of the sensitivity of d-wave superconductivity to impurities, this advance was the key ingredient in establishing the properties of the high T c superconductors, allowing the determination of the d-wave state, the fluctuations and other novel features. For many years, Ginsberg authored the sect ion in the Encyclopaedia Britannica on superconductivity; in addition, he wrote several influential review articles and book chapters, starting with his review (with L. C. Hebel) on “Nonequilibrium properties of superconductors” in the seminal two-volume set edited by R. D. Parks in 1964. During the early 1990s, Ginsberg edited the definitive five-volume book, The Physical Properties of High Temperature Superconductors, to which he also contributed. Donald M. Ginsberg was born on November 19, 1933, to Maurice Jesse and Zelda Robbins Ginsberg in Chicago. He joined the department of physics at the University of Illinois immediately after finishing his graduate work with Professor Michael Tinkham at the University of California, Berkeley, in 1959. He took sabbatical leaves at Cambridge University (UK), UC Berkeley, UC San Diego, The Ohio State University, and IBM T.J. Watson Research Laboratory. In addition to being a Fellow of the American Physical Society, his awards include the Sloan Foundation Fellowship, the Daniel C. Drucker Tau Beta Pi Eminent Faculty Award (U. Illinois), University Scholar (U. Illinois), associate in the Center for Advanced Study (U. Illinois), and the Oliver E. Buckley Prize of the American Physical Society. Ginsberg’s research was in superconductivity, and he played a major role in almost every fundamental aspect of this field since the late 1950s. Building on his far-infrared graduate experience, he helped to develop planar quasiparticle tunneling spectroscopy as a vital probe of the energy gap of metallic superconductors. In the 1970s, he contributed greatly to the understanding of the effects of magnetic and non-magnetic impurities on the electronic structure of superconductors through a wide variety of measurements, including electronic transport, thermal conductivity, specific heat, and magnetic susceptibility. In the 1980s, Ginsberg extended his research to incorporate binary and ternary compounds, finally focusing on the molybdenum chalcogenides(sometimes referred to as Chevrel compounds), perhaps the most complex superconducting materials known at the time. Because of their complexity and inherent sensitivity and instability, Ginsberg realized the necessity of growing his own well-characterized and clean crystals in order to measure their fundamental properties, and thus became a world leader in preparing samples of these compounds. Ginsberg not only determined the structure and physical properties of the Chevrels, but he supplied crystals to dozens of colleagues for a broad variety of measurements. Following the discovery of cuprate superconductors, Ginsberg was quick to redirect his lab in this direction. He tried every published recipe for creating good samples but was dissatisfied with all of them, finally developing his own approach. He claimed that the most important hint for the best recipe came from a colleague whom he met in a chance encounter at an airport. Not only did he make the most careful transport and equilibrium thermodynamic measurements, but he generously shared his best-in-the-world crystals with colleagues at numerous institutions around the world, despite the intense competit ion in the field. Working with the group of Dale Van Harlingen, he established the high-temperature superconductor YBCO to have d-wave pairing symmetry and shared the Oliver E. Buckley Prize with Van Harlingen and J. R. Kirtley and C. C. Tseui of IBM’s Thomas J. Watson Research Center. At Illinois, Donald Ginsberg was widely recognized for his outstanding classroom teaching. Thirty-six PhD students did their research under his direction. 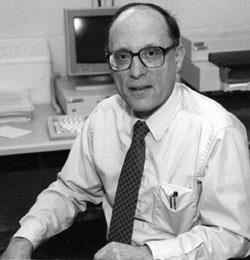 Donald Ginsberg published more than 240 papers with many hundreds of coauthors at two dozen domestic and foreign institutions. He was greatly appreciated by his colleagues for his science, but equally for his wide range of interests outside of physics and his direct and often humorous way of expressing his thoughts. To celebrate his retirement, on April 19, 1997, a day-long symposium entitled “Superconductivity with a Smile” was held at Illinois and attended by more than 100 colleagues, former students, and friends, some of whom traveled hundreds or thousands of miles to be there. Many others from around the world who could not attend sent their best wishes. In addition to his accomplishments in physics, Ginsberg enjoyed the cultural side of life, especially music, which he indulged by playing the flute, and poetry. After his retirement, he wrote several books of poetry, which featured his whimsical observations of physics, physicists, and personal life. No event was too small to be lampooned by his fiendishly dry wit and droll turn of phrase. For example, in considering his own long career at Illinois, Donald remarked simply to a colleague a few months ago, “When they ask about the old days, just tell them we had a good time.” With the passing of Donald Ginsberg, the world has lost a resourceful and clever physicist and a uniquely multi-faceted personality. We'll miss him very much.